Steve Holcombe triumphed in both days of racing in the Enduro GP and in the E3 class and Andrea Verona won both days in the Junior class. An adrenaline-filled weekend in the E2 class with Loic Larrieu who won on the first day. Thomas Oldrati, Alex Salvini and Daniel McCanney also performed excellently. Dahlen (Germany), 24 March 2019 - In Dahlen, a town in Saxony, the first round of the FIM EnduroGP World Championship took place on a mainly hard surface with many muddy and sandy points. There were four special challenges programmed, each with three laps. The METZELER riders Steve Holcombe (Team Beta Factory Enduro) and Andrea Verona (TM Racing Factory Team), equipped MCE 6 DAYS EXTREME tyres as all the other riders supported by the brand of the blue elephant, were the undisputed leaders in Germany in their respective Enduro GP, E3 and Junior classes. In the Enduro GP Steve Holcombe (Team Beta Factory Enduro) dominated both days of racing, with a significant lead over his adversaries. An excellent performance was also seen for the new member of the TM Racing Factory Team Daniel McCanney who took home a second and third place. In the E1 class, Thomas Oldrati (Team Honda RedMoto) won two excellent third places. The E2 class was full of surprises during the weekend of races in Germany. Loic Larrieu (TM Racing Factory Team) won on the first day, coming in third on the following day. It was an excellent trial for the Bologna-born rider Alex Salvini who, on day 2, took second place on the podium. A double win in the E3 class for the METZELER-supported rider Steve Holcombe. The rider from the Team Beta Factory Enduro dominated the first GP of the season. Two second places for Daniel McCanney (TM Racing Factory Team). It was also an excellent weekend of racing for the rider from the TM Racing Factory Team Andrea Verona who won both days in the Junior class. 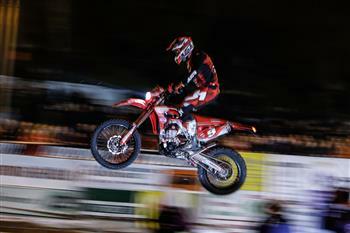 The FIM EnduroGP World Championship will return on 4 and 5 May in Valpacos for the Portugal GP. Alex Salvini in the E2 Class.